kirin notebook - the blog of lara cameron: sketchy! I recently had a request from an interviewer for some pictures of my sketchbook. I took a bunch of photos and then thought I'd be a nice thing to post here, to show a bit of the process behind my designs. Not that any of these sketches relate to any of my current patterns, but they might one day! I am in serious love with the book tree. I hope you will make it into something. thanks for sharing.. I love seeing this behind-the-scenes type stuff. I love the sketch of the trees in the center square. It reminds me of how the forest around my cabin looks. I hope you'll develop it into a print or fabric someday. Beautiful and inspiring sketches! One of my favorite things in learning about a new artist is seeing a little of the process behind their work. Thanks for sharing! a book tree is also in my sketch book...something so dreamlike and storybook like about it...my daughter loves her books more than anything so I am always thinking of ways to incorporate into her room decor...well done! i enjoyed looking at your sketchbook. i'm surprised those images haven't all turned into some kind of product or other yet. anyway, just wanted to let you know that i've finally opened shop. the only things i have on there are flat note cards of my own designs. thanks and can't wait to see what you'll produce with your images! i love seeing inside people's sketch books. lovely to meet you the other night at bamakko Lara. and a huge congrats on getting into Sunday's paper! I like your sketches! It is one thing I really wish I could do - draw! Ok I also wish I could sing, stop eating chocolate, not need to go to the dentist tomorrow..... but being able to draw would be a good thing. The book tree, as it's already been dubbed, is fabulous. They're leaves, I can see them. None have fallen out to create an autumn story of fallen leaves. Lovely, magical. I like the birds most! 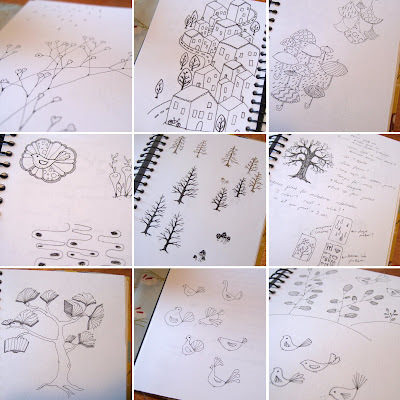 How lovely to have a glimpse of your sketchbook-some really great designs there! ooh! i love this. it's so great seeing other people's progress work. Thanks so much for sharing! Love the book tree...and the village...and - all of them!! PS I have put a pick of some shorts I made for my Miss Grace from your fabric on my blog. Love to see the behind the scenes creative process. Thank you! As many others, I love the book tree. This would look great as a poster for the Children's Book Council of Australia, Book Week. The book tree, the leaf-less trees, and the birdies are all fantastic. love it all. I love looking at other peoples' sketches. These designs are great as are all your fabric designs. Great blog.